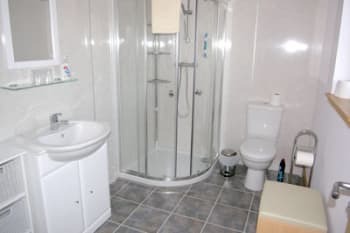 A double room with large en-suite shower-room and toilet, and with superb sea views. We are right on the water's edge and guests can often see otters, herons and other sea birds from the windows of their room. Binoculars provided! We just have the one guest room so there's no fear that you will be disturbed by other guests. The price includes breakfast which is served in our dining room overlooking the water. You can choose a full Scottish cooked breakfast or something lighter. Fresh fruit salad and home made bread are always available. We don't have a guest lounge but your room has two chairs and a little table, and of course the wonderful sea views through the large windows. There's also a picnic table outside for guests to use. Highly recommend a stay here. View phenomenal, peaceful and quiet. Great location for attractions on Skye and mainland. Great view of the water and mountains. Lovely room with a great view, big shower-room. Breakfast was excellent. Owners were very nice and helpful. Buena ubicación y precioso lugar cerca de Broadford. Los dueños encantadores. Recomendaría el restaurante The Harbour en Broadford. La cocinera es mallorquina y la comida muy buena. Very friendly, happy for us to come and go as we pleased which was great as the weather was poor for a while. Very clean and breakfast was lovely. We had to leave early on the last day and the host gave us a very nice breakfast bag which was eaten while we waited for the ferry. Just the job. Nice friendly pizza place in Broadford - pizzas lovely and they do a huge pot of coffee for under £5, plenty for 2. Fantastic Bed and Breakfast, best one we have ever stayed at! Rick Steves Scotland guidebook is an excellent place to start for what to do on the Isle of Skye! 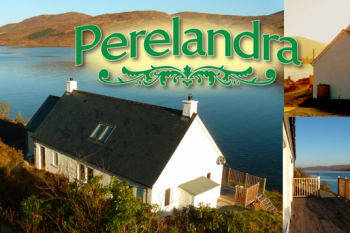 We had an amazing stay at Perelandra! The accommodations, location and service far exceeded our expectations! The view from our room was breathtaking and incredible to wake up to! The breakfast was delicious and our favorite breakfast in Scotland! Hike Old Man of Storr and check out the Fairy Pools early before it gets too busy. We had less than 24 hours on the Isle of Skye and next time, we're dedicating at least 3 days to truly enjoy everything that is offered! You are very kind and helpfull. Breakfast was good with fresh fruit. It's also a big plus for travellers that they can stay at your B&B any time of the day. Thank You so much! a visit to Canna. walk into the woods at Sleat. you will have a marvelous view. Lovely place to stay at. Really convenient point from which to get around Skye, if you are driving. The room and bathroom are both large, comfortable. Room has the best view ever. Breakfast is great too. There's only one room so if you can book the room, do. A number of restaurants are nearby. There's a great little shop selling antique items, fun to rummage through. A great spot to stay, very pleasant couple and a delicious breakfast. Only stayed the one night as travelling to Harris but would have definitely stayed for longer. A lovely treat. It was a great stay. Perfect location. great host. A bit hard to find coming from Portree in the dark and rain. Clock your odometer to Portree and use it on the way back to the cottage. Lovely clean and cosy room with the most amazing views. Breakfast was great. Nothing was a problem for Gill, she even suggested some places to visit. Great little place, great view. Owners were very nice and helpful. Room was cosy and clean. Thank you for a lovely stay! We felt at home and were impressed by the lovely and generous breakfast and a beautiful view. Great restaurants in short driving distance. We hope to return to Skye for a future trip and we hope we would be able to stay here. Very pleasant location to stay on the Isle of Skye. Tricky driveway access. Excellent breakfasts and very comfortable room. The road to Elgol was a great recommendation. Dinner at the Seabreeze in Portree was very good. Welcome and cleanliness were excellent, as were all other facilities and services. The addition of a box of tissues would be good, as most hotels now provide this. Very new and clean house. 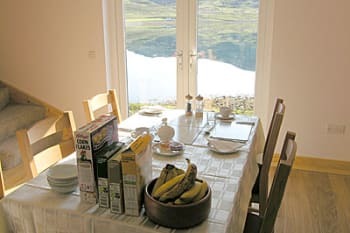 It's in front of a loch and the views from the windows and during the breakfast were amazing. Hosts were very kind all time. The house is near Portree and the Fairy Pools. Breath taking scenery, a friendly welcome and a wonderful Scottish Breakfast! Very helpful staff, and a nice view of the lake! The breakfast was also nice. Great location and very helpful with information about the island. The hearty breakfast was great before a day of hiking and our chosen hikes were based on the hosts recommendation. They were fantastic hikes and would stay here again, though for longer next time! Splendid location right beside the loch. Friendly owners preparing a full (personalised) Scottish breakfast in the morning. Skye is just beautifull. Broadford with nice restaurants is closeby. You should certainly have a drive to Elgol and take the boat trip there. Nice views on black Cullins, seals and a walk towards a remote loch. Very friendly hostess, rich breakfast, the room close to the water. Thank you for the warm welcome! From arrival to departure we were well looked after. Could just sit and watch the views and wildlife from the bedroom window. The breakfast and the bread is fab. Skye was a brand new experience for us. Just relax and visit everywhere you can in the time you are there. 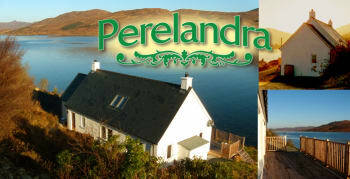 Perelandra is beautifully located, has excellent facilities and a great pair of hosts. visit old man of storr and the quirang. Thanks for alerting us to a possible problem with the bed. We checked and found that one of the casters had broken off, which made the bed base uneven. This has been corrected now and all the guests who have stayed since have confirmed the bed is very comfy. Warm and friendly hostess, cooks a mean Breakfast. Clean and modern facilities. Leave curtains open when you go to bed as stars at night and morning views are too good to be missed. Too many to chose from but hostess sent us to the old inn and thoroughly enjoyed our meals there, probably would be a nightmare to get a table high season. Loads of lovely walks throughout the island but our most memorable to date was the fairy pools, well worth a look and a nice pleasant walk. Warm, helpful, friendly hosts. Everything was great and breakfast was delicious! Great location, centrally located. Beautiful view from the bedroom! Highly recommend. We are more than a little biassed as we stayed here three years ago and everything this time was just as good as before! Gill and Steve are excellent hosts. We were made to feel so welcome straightaway and we could come and go as we pleased throughout our stay. How could you enjoy a delicious breakfast more than by looking out across the water to the little island of Scalpay; we think not! Towards the south of Skye, not far from the Skye Bridge and close to Broadford for a reasonable choice of places to eat from takeaways to hotels. A good base from which to explore the whole of Skye. We were touring so the spectacular east and north coasts around to Uig made a good day trip, to Talisker Bay and The Cuillins mountains another and out to Dunvegan one more. Everything was great. The B&B is easy to find. The room and bathroom were immaculate, charming and well equipped, the view amazing and the breakfast perfect. Thank you for an excellent night's accommodation and superb breakfast. We really enjoyed it. Perelandra is so lovely. A peacefull place. Gill and steve are very nice. Lovely place to stay. Nice people, nice bedroom, nice bathroom, nice breakfast. You can even sit on the bed and watch the busy bird life out of the window with binoculars provided! Unless you are keen cyclists you can't really do much on Skye without a car. Very few useful buses and several miles to get a meal. Great comfortable room. Good shower and excellent breakfast. Lovely walks from Sligachan Hotel into the Cullin hills. Not too keen on Harbour Restaurant in Broadford, the bread and AliOly is a rip off. It was a very beautiful place, we wish we could have stayed longer! Room with sea view was lovely. Very friendly people, great breakfast. Definitely recommended. Tip for other travelers: read the "travel" section on the website, because the address is hard to find on the sat nav. A very peaceful location with a wonderful view of a tidal loch. Excellent eggs and fresh fruit salad for breakfast. The landlady is full of helpful suggestions particularly for walkers. All in all a perfect B and B. Sea Breezes restaurant in Portree along the harbour is excellent for local shellfish as is Cafetesia in Broadford for very good pizza. All was great: accommodation, food, location. The owners are extremely kind and helpful. Definitely we would go there next time. So lovely. 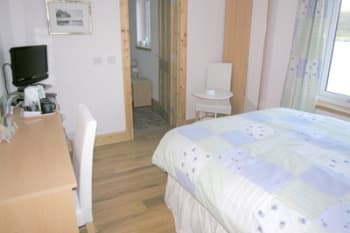 There is only one rented room in the place, with a large en-suite and huge windows overlooking the loch. Gill was so lovely, we had a fabulous breakfast and thoroughly enjoyed chatting with her. She knew the best walks to take after dinner, and we hugely appreciated the tip to eat at Seumas Bar in the Sligachan Hotel, they did a great fish and chips so good we went back the next day and had them again. If you're looking for a charming spot, peaceful, quiet, with unbelievable views and a nice host, look no further. Many thanks indeed for your lovely review. I am so glad that you enjoyed your stay! All the best, Gill.